If I didn’t pre-register, can I still attend? Yes. Check in at the Alumnae House upon your arrival. If you need housing, you will be assigned a room, although not necessarily with the rest of your class. Meal reservations will be accepted after April 26 on a space-and meal- available basis only (a $10 per adult, per meal late fee will apply). What is the class registration fee used for? The class registration fees are set by the individual classes to help defray class Reunion costs. Contact your class Reunion chair for more information about the class registration fee. Can I register now and pay when I arrive for Reunion? No, payment must accompany the reservation. Do I have to pay my class dues to attend Reunion? The class registration fee generally includes the dues fee for the year, however classes cannot require classmates to pay dues to attend Reunion. If I register and can’t attend, can I get a refund? Class and college registration fees are nonrefundable, and meal fees are nonrefundable after April 26. Requests for refunds must be made in writing and received or postmarked no later than April 26. All refund requests will be reviewed and processed following the completion of Reunion II weekend (May 26). Please allow up to four weeks for receipt of your refund. NOTE: All alumnae MUST register at the Alumnae House to be included in their class attendance count. 65th, 70th, 75th and 80th Reunion classes register at Lamont House. When can I arrive for check-in? Reunion check-in runs from 4:00 – 9:00 p.m. on Thursday of each weekend. Reunion registration opens at 8:00 a.m. each Friday. May I check in earlier than the official check-in period? When do I have to be out of my room? Will there be someone to help with my luggage? Student porters may be available to help with luggage. Student ambassadors will be assigned to all classes and may also be able to help with luggage during peak arrival and departure times. Where do I go if I arrive after the Alumnae House closes? Call Campus Police at 413-585-2490. An officer will be dispatched to let you in and give you your room number. You must stop at the Alumnae House the next morning to officially check in and pick up your key card to access your house. What is the rate for one night? There is one flat housing rate of $150 per person per bed for the full weekend (3 nights). This rate includes continental breakfast on Friday, Saturday, and Sunday mornings. We cannot prorate the housing charge for single nights. Is there a charge for my child? If you want a separate room or bed for the child, the same housing charges apply. Otherwise, your child can sleep in your room, but you will need to provide your own sleeping bag, porta-crib or air mattress. Will I be able to stay near my friends? Each class is assigned a group of houses. Alumnae and guests will be housed with their reuning classmates in multiple houses assigned to the class. Housing will be located in or near class headquarters, which is the main gathering place for alumnae. What is my room assignment? You will be given your room assignment when you check in at the Alumnae House upon your arrival on campus. Am I guaranteed a room in on-campus housing? No. Register early in order to make sure you get housing. 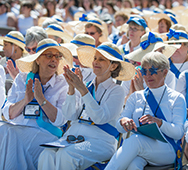 Alumnae registering for Reunion as 1776ers (those not in one of this year’s Reunion classes) will be automatically placed on a wait list for on-campus housing when they register for Reunion I. We will notify 1776ers via email if we can accommodate them in on-campus housing or not by April 26. Payment for housing will be due at the time of notification. For a list of local inns, hotels, and bed & breakfasts, please click here. There are also rental services such as HomeAway or Airbnb. I need to be in a handicap accessible room in a house with an elevator…or any other disability housing requests. Indicate this on the ‘health-related accommodation needs’ line in the Housing section of your Reunion registration. Only if there is something wrong with your room upon arrival. No. Smoking is prohibited in all buildings on campus, including student residences. Will my room have a private bathroom? No. Pets are not allowed in student residences, except registered service animals. Will there be a place to secure valuables? No. You will not receive a key to your room and there is no place to store valuables. Does my house have an elevator? Chase/Duckett, Comstock/Wilder, Cutter/Ziskind, Lamont, King/Scales and Northrop/Gillett have elevators. How can someone reach me in an emergency? They should call the Alumnae House at 800-526-2023, option 4, and someone will get the message to you. If the Alumnae House is closed, they should call Campus Police at 413-585-2490. Can I bring a guest/spouse/partner/child? Will my guest/spouse/partner/child be staying in the same room as me? We will try to accommodate spouses, partners, and children in double rooms (2 single beds), however, most rooms on campus are singles, with one single bed – partners will be assigned to a nearby room if a double is unavailable. You should bring a sleeping bag, porta-crib or air mattress for a child who will be staying in the same room. Will there be a spouse/partner program? It’s up to the individual class; you should contact your class Reunion chair. Are guests/children allowed to attend class meals? Are children allowed to march in the Alumnae Parade? Are there separate bathroom facilities in the residence houses for men? No, especially during Reunion/Commencement weekend. During the All Reunion weekend, classes may designate certain rest rooms in the houses for men. Can my guests use the athletic facilities? Yes, but children must be accompanied by an adult. Yes, each meal will have a vegetarian and vegan alternative. Is there a separate price for children’s meals? Yes, meals for children 12 and under are available for $11 per meal. The parking garage on West Street (Route 66) is open. Maps of campus parking areas will be available at the Alumnae House and Class Headquarters. City of Northampton and campus parking regulations remain in effect, including metered parking spaces. I’ll be driving an RV – where should I park? All mobile homes and self-contained vans should be parked in the Indoor Track & Tennis Facility lot (preferably) or the Ainsworth Gym parking lot. Will there be shuttles to transport my luggage and me to my house? Yes, on-campus shuttles will be available to transport you to and from parking areas and student residences. Will there be a shuttle to take me to and from my hotel? No. Shuttles are for on-campus transportation only. Do AASC lifetime members receive a discount? Fully paid lifetime members of the AASC in reuning classes earlier than 1996 are entitled to a $25 discount on on-campus housing. This discount cannot be applied to the class or college registration fees or meal fees. If applicable, this discount will automatically be deducted from your online registration. Will I have access to the gym and library? What events are planned for my class? Programming is planned by the individual classes; you should contact your class Reunion chair. I want to attend Reunion, even though my class isn’t reuning this year. You may attend as a member of the “1776” class. You can register online. I will need a wheelchair or special assistance for a medical condition. Contact Laura Rauscher in the Office of Disability Services at 413-585-2071 to discuss your needs and/or obtain information. If you use a wheelchair, we will have staff available to assist you in the parade.